I haven't found setting to set hidden directories visible in program. Is there such setting? Ok, thanks, it's really that. I know a long time has passed, but... the suggested solution doesn't work on Mac OS X, as the default system file pick dialog is shown. 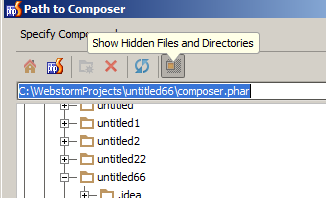 It doesn't contain the 'show hidden files' button (Webstorm 2017.3).